Stuart kept reporting from the PTFF in several installments today, all sent from his iPhone. 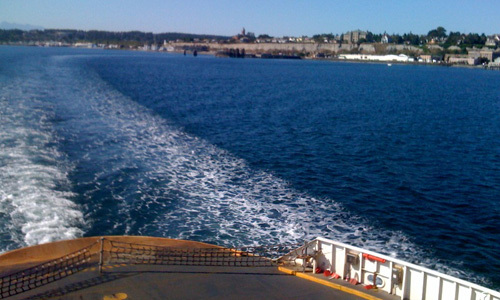 9:48 AM: Got to catch a ferry to Whidbey Island to see Maxine Martell. I hope I'll have connectivity there, but I'll write more as soon as I can. 12:09 PM: We're at the ferry, waiting to cross over Puget Sound to visit 1000 Journals artist Maxine Martell. I met many of the PTFF staff in town this morning and had a chance to thank them for their wonderful hospitality, generosity, respect, and attention to detail for each film. I would recommend this festival to any filmmaker because the staff and the entire town deeply care about the event. 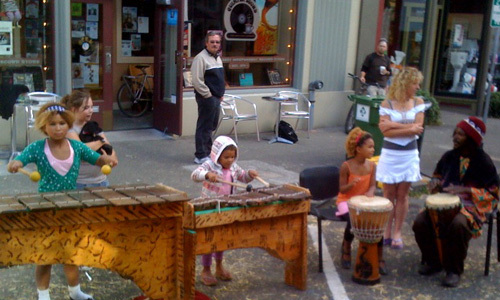 It was well attended by people all over the area, including Seattle. Although we did not "win" Best Documentary, the film was very popular and much talked about. Lots of questions in both Q&A's. More photos to follow. 12:12 PM: Musicians in front of the Rose T -- and they were good! 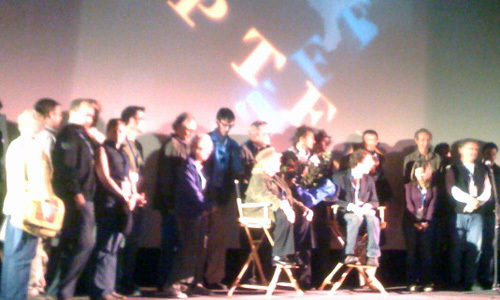 12:22 PM: Award ceremony - I'm standing behind and to the left of Piper Laurie, seated on the left.